Chris K. of Hill Cantons is one of the procedural innovators of the OSR blog scene, and his innovations are all the more valuable for arising from solutions to problems experienced in actual play. For examples, see posts on point crawls, ruin crawls, and the chaos index. So, I was excited to see how Chris would realize these ideas in a more formal product, such as Slumbering Ursine Dunes (original kickstarter, current RPGNow PDF). For a quick overview, the atmosphere of SUD is one part Slavic mythology, one part Moorcock. The major points of the content are a small scale, keyed wilderness, two medium sized “dungeon” adventure sites, a collection of monsters, faction details, and a modular subsystem (the chaos index) which could be used generally. The dunes and adventure sites are both flavorful and easily integrated, I suspect, into most exploration-focused hex crawl type campaigns, though see the note on Slavic cultural specificity below. The tone is light, and though it violates my general preference for setting as straight man (players generally add enough humor on their own), the numerous jokes and site gags here work. For example, the sloth variation on another classic monster, the Terminax, etc. The basic structure of SUD is a master class in faction design, and for me this was both a complete surprise and its strongest component. Adding any factions at all to an adventure site increases the richness of potential interaction, but the distinct character of each faction here seems like it would drive dramatic conflict particularly well. There is one faction of each major alignment quadrant (lawful good, chaotic good, lawful evil, chaotic evil). Thus, one faction is just interested in carnage and watching the world burn, but all could be useful by enterprising and creative players. When I bother with alignment at all, I generally gravitate toward cosmic interpretations that equate chaos and magic, such as forwarded by Carcosa and LotFP generally, but this setup makes the nine point alignment system shine in a way that I have not seen done nearly as effectively before. The Eld presence in the Dunes precedes even that of the Master, the extradimensional elves having wrestled the Glittering Tower from the Hyperboreans back when their necromancer king-led states began to crumble more than a 1,500 years ago and then lost it to Medved when he ascended to divinity in the area. I also enjoyed the immanent divinity of the many minor gods. This is not just a point of taste, though it is that as well. Making deities immanent means that players can interact with them in play. It transforms a campaign element from either info dump or character build option to active encounter, so engaging all players, not just those that do their homework. The area of the dunes is intended to be governed by mystical, dreamlike logic rather than staid ecological assumptions. In Chris’s home campaign, this is manifested as shift from rational, civilized areas to impressionistic, wild areas called the Weird. It is easy to say this, but standard causal assumptions can easily reassert themselves unless the Weird manifests in play, either through continuous referee engagement or some game system. The chaos index is such a game system. It consists of three a5 pages detailing a simple state machine and several random tables. The referee (secretly?) maintains a number representing the irrationality of a campaign area. (Pause a moment to absorb the irony of managing chaos with a numerical, predicable framework.) Depending on the chaos index level, the referee rolls on various tables which include outcomes like a tesseract opening, the arrival of Eld Bubbleships, and shadowy illusions. The chaos index by default rises 1d4-1 points each session (thus, the expected rise is small but positive) and is also affected by player actions. The system is light enough that I do not think it would be a drag to use, and the tables could be repurposed for encounters or magical catastrophes even if you do not want to engage in the rather minimal bookkeeping. The layout is unfortunately not as useful as it could be. Objects such as tables are often spread between two pages or even between two spreads. Examples. Pages 7, 8, and 9. Pages 41, 42, and 43. Zombastodon stats are on page 54 and description on page 55 (which are two different spreads). And so forth. Maps diagrams and key entries do not generally share a spread, requiring either page flipping or printing out maps (one more thing to shuffle). Descriptors are also often nestled within several paragraphs of prose, which means I either need to read and take notes, scramble to reread continuously during play, or miss details. 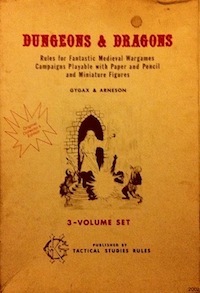 Though this remains the standard mode of module writing, and is good at communicating atmosphere during a linear read-through, I find it difficult to use at the table. These are not huge flaws, but I highlight them to bring them to the attention of future creators. A table of contents (both textual and as PDF metadata) would also have been appreciated, to allow quick access to modular tools such as the chaos index. The art in SUD proper (example) is also not exactly to my taste (the texture looks too much like Photoshop brush). It adequately illustrates many included situations, but does not excite me. I am looking forward to the art in the related and upcoming Misty Isles of the Eld supplement by Luka Rejec. Despite the layout (objective) and art (subjective) critiques, this is a great little module with several new ideas and fun, interesting details. The content could easily be used in an existing hex crawl, many of the tools are modular, and it is particularly worth picking up to see the faction presentation and how those affiliations permeate all aspects of the scenario. 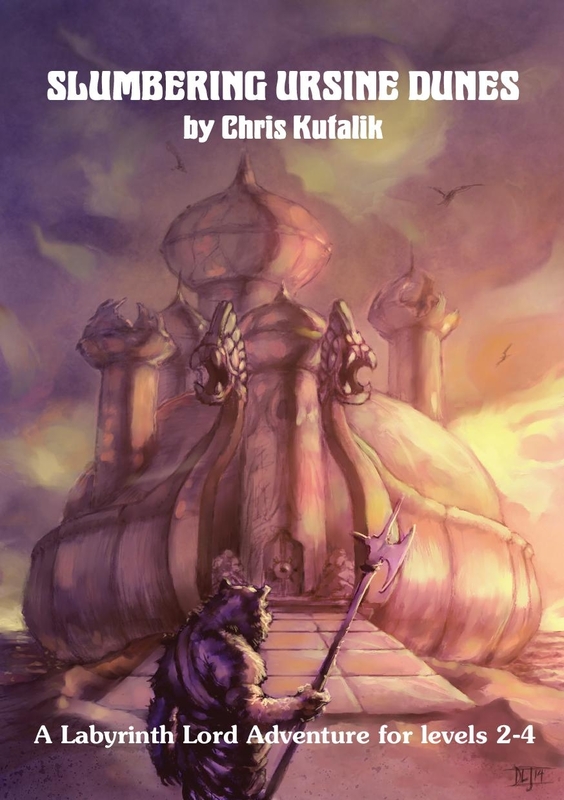 You can buy the PDF or print on demand perfect-bound paperback at RPGNow. This entry was posted in Reviews on January 12, 2015 by Necropraxis. Awesome review – I missed the kickstarter for this one, glad to see it’s out on RPGnow. Love Chris’s blog, I’ll need to check out the book – sounds like it has a lot of good ideas.